I officially have a new favorite tomato. Thanks again to Danni over at On the Way to Critter Farm, I grew these egg yolk heirloom tomatoes from seed this year. Just as she promised, they’re a sweet, yellow tomato about the size and color of an egg yolk. We had our first frost on Monday night, which means no more tomatoes from our garden this year. Hmmph. 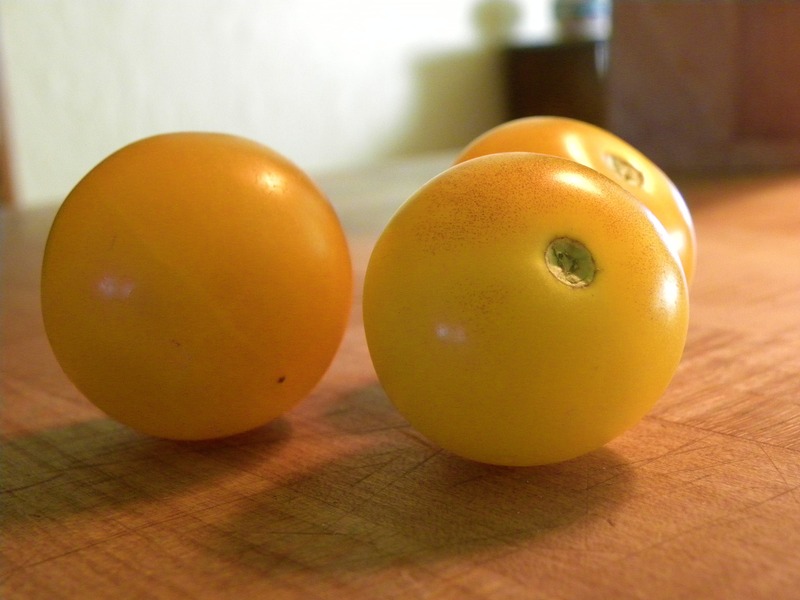 Yellow tomatoes fresh from the garden–best discovery ever! Never heard of heirloom egg yolk tomatoes, but they look delish! Thought they might be the sungold cherry ‘maters for a second; those are my favorites. You reminded me, I haven’t gone out to harvest the batch of red cherry tomatoes that ripened while we were gone this weekend. If you were a backyard neighbor, you could hop the fence and help yourself! I wish! 🙂 Can’t wait to see more of the pictures from your trip. Uh, yeah…right after the kitten stops being so cute, lol!! Really?! How fascinating… I learned something new. Thank you! My sister has always grown heirlooms – my fav is called the “ugly” tomato. It might look ugly, but it is the best tasting thang eveah! I’m totally going to look that one up… I’m hooked on heirloom tomatoes now. Justina, your tomatoes are beautiful and looks delicious too! I do like the little tomatoes. So much sweeter & firmer. I’m surprised to hear that you already had a frost. I’m always taken by surprise whenever there’s any mention of colder weather in New Mexico. I just can’t get my head around that. It’s like learning that Santa Claus isn’t real. Haaaa….that made me laugh that you had forgotten they were supposed to stay yellow and were waiting for them to ripen! I am so, so, so happy that your tomato season was so successful! Did you save some seeds from a couple Egg Yolks (that sounds funny) so you can have more tomatoes next year? Our tomato season was successful thanks to you. 🙂 It just so happens I have two Egg Yolks sitting on the kitchen counter along with three Riesentraubes, along with a coupla mason jars and some cheesecloth… waiting for the seed extraction to take place this week. Mmmmmm. Tomatoes. Possibly my favorite food, other than Macaroni and Cheese. I can remember (vividly) eating mac n’ cheese with sliced tomatoes as a kid. That was like one of the best things ever! Oh my! They do look just like fresh, yellow egg yolks! I bet they are yummy. I had never heard of that variety. I think I will need to look into getting some of those seeds! They are yummy! I’m going to save seeds from this harvest and am sure I’ll have extra if you’re interested… just let me know and I can send them to you. I just wished I like tomatoes because they look so darn good! One of these days….. I still would like to grow some adn grow a nice garden. Maybe I would like the egg yolk ones. We missed you! Hugs to you and Russell. Yum, tomatoes. I adore tomatoes. Yummeee!! Once we are settled in to the new house next year a big garden is going in. And am of course going to have to plant some of those most beautiful yellow ones! I’m so happy you’ve found a new place for you and your critters. And a beautiful one at that.